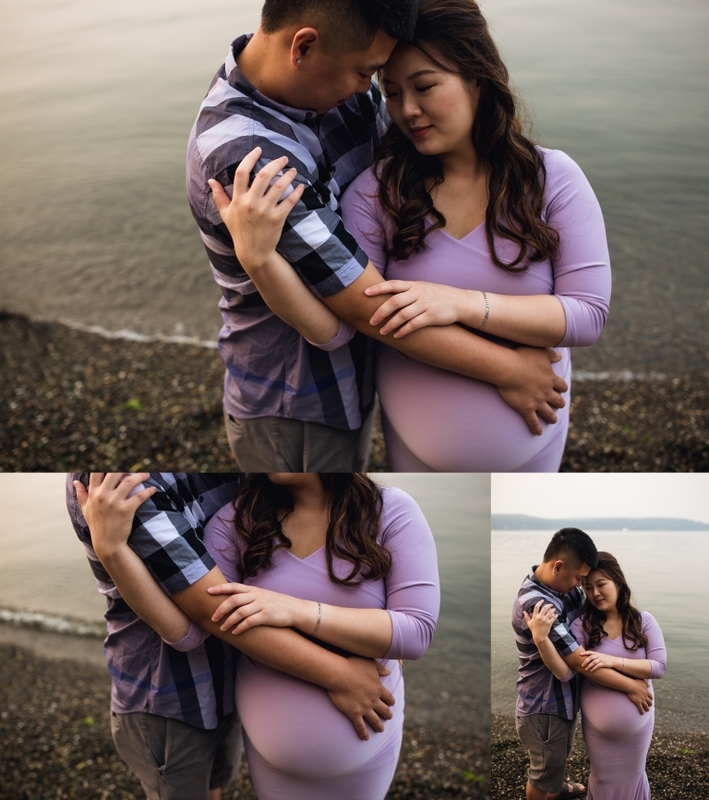 I love when parents ask me to be their Tacoma Maternity Photographer! I love being a part of the journey and photographing this special time in their lives! When we planned their maternity session, the vision was to go down to Ruston Way in Tacoma. When we arrived, the tide was very high, so we had to adjust our location. We decided to go to Owens Beach instead and I’m so glad we did! The night of their session was also hazy because of the recent wildfires our area was dealing with. The smoke created a haze in the sky, as you can see in the photos, but it made for the best moody look! I absolutely love how the session turned out with that added detail! My favorite thing about the maternity session was mom’s dress! The lavender color and perfect fit complimented her so well! She’s just stunning! It really gave the haziness the perfect pop of color too! Mom was also brave enough to get into the water and I’m so grateful she trusted me with my vision! Sometimes its hard to convince someone to get into the water, especially with a beautiful dress, but mom didn’t hesitate at all!